ESTA NOCHE REGALAMOS LAS TARJETAS DEL CLUB A TODOS!! PODRAN ENTRAR EN ANDAYA CLUB GRATIS TODO EL ANO!! LLEVARSE DNI ! TONIGHT WHATs a PSYCHEDELIC NIGHT IN TENERIFE SOUTH!! ALL INFO ON GOABASE GUYS!! FREE PARTY! CANNABIS SOCIAL CLUB "ANDAYA" ,18 VENEZUELA STREET , UNDER PONDEROSA HOTEL, LAS AMERICAS,TENERIFE SOUTH. LA ENTRADA NO SE VE DESDE LA CALLE, HAY QUE ENTRAR DESDE LA TERRAZA DEL BAR CALIPSO A LADO DEL RESTAURANTE TITO. ENTRY IS NOT VISIBLE FROM THE STREET, YOU MUST TO BE ENTRY FROM THE TERRACE TO THE CALIPSO BAR , CLOSE TO TITOìS RESTAURANT. 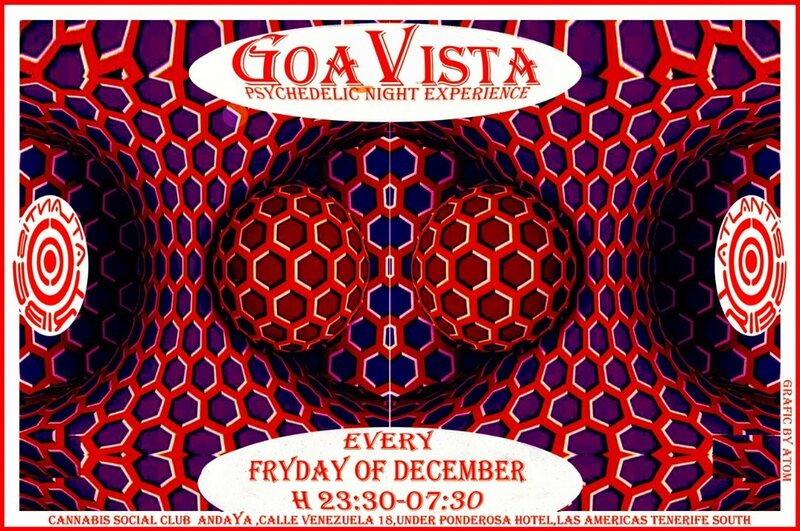 GOAVISTA- ATLANTIS TRIBE CLUB PARTY-EVERY FRIDAY OF DECEMBER!